For the last several years, dire warnings of “content shock” have cast doubt on the continued ability of thought leadership content – or any kind of content marketing – to deliver results. But new research provides fresh encouragement for thought leadership marketers, especially those targeting senior-level decision makers. First of all, do you draw a distinction between thought leadership content and other content marketing? There is an awful lot of content out there at the moment which, at best, is interesting opinion, and not much more than that. At worst, it’s self-serving and rather salesy. Good thought leadership does more than that. It brings original insight backed by evidence, and that’s why you see research as a big part of the thought leadership mix. The C-Suite has always been difficult for marketers to reach, let alone engage in a meaningful way. Does your new research identify any promising new paths for getting content to the corner offices? What was really, really encouraging for me with this research (and we surveyed over 1000 senior executives from a cross-section of industries, in terms of how they engage with this type of content) is that they value thought leadership…providing it’s good. That came across very strongly. They like opinion, but opinion on its own is not enough. It has to bring something else, some evidence behind the assertions being made. But if you take those three things and then you bring them to life in a way that’s easy to consume and interesting to engage with, there’s a hunger for it. There’s enough going on in the world, enough challenges that these executives are uncertain about, so actual insight that tells them something they don’t know, that helps them solve their business problems, is valuable enough for them to engage with. Other things we found include how long they spend consuming thought leadership. On average, in this research, senior executives are spending four hours consuming different forms of thought leadership content every week. If you compare that to some of the metrics that digital marketers talk about, measuring success in terms of seconds and minutes, that shows something that has real power. 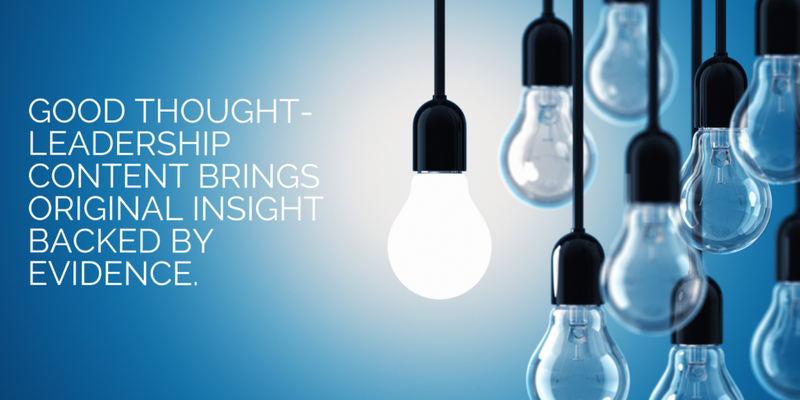 What did the research say about the impact of effective thought leadership? It shows that senior executives use it to inform decision-making. For example, when they perceive a brand to be exceptionally good at thought leadership, then they are more likely to favor that brand in terms of considering them for business tenders. You’ve looked at how senior people use and consume content – but what are your observations on their role in formulating, projecting and leveraging thought leadership? Do they need to be thought leaders themselves? The very best organizations have an alignment between the marketing function and the leadership function that’s driving these programs and campaigns day to day. But the programs that work are the ones that have a very senior business stakeholder or a set of business stakeholders who want to own the message. They have bought into the program right from day one, and their mission is to be the face of the campaign. For instance, we’ve worked with a brand called AECOM, which is a leader in the architectural and engineering industry. They use this kind of work at places like Davos, at the World Economic Forum, where their senior people are up on the podium, referring to the research and helping to establish the company’s credentials as the facilitator and the leader of their industry on particular issues. That’s when you get a real pair off, I think, on content. It hops from reports and text-based or even video-based outputs right into the dialogue of the organization, and it gets knitted into the C-Suite conversation. What types of content are clicking with the C-Suite? One of the other things that we’ve learned from the research we’ve done recently is that you have to give your business audience choice. Lots of people prefer to consume information these days in a video or a podcast. However, there are still plenty of our executives who are traditionalists, in terms of their willingness to concentrate on text. So, I wouldn’t rule out the value of longer-form assets, certainly in terms of showing there’s real substance and credibility. You need that mix of serious study, more digestible, snackable content, and everything in between. This pendulum keeps swinging back and forth. What do you see on the horizon, in terms of executive thought leadership? We’re predicting quite a few shifts. It’s a very fluid space in cutting-edge practices moving forward. The first is, I suppose, a more agile model for thought leadership. There’s definitely a sense that the model as practiced by corporates needs to move on from something where you do a project that starts with a very heavy-duty survey. You roll out the content, then the whole campaign comes along. Before you know it, you’ve sunk nine months into this project before there’s even anything ready to share in the market. That’s shifting now to having something that’s more iterative, and maybe more of a multi-track process on the research, so there are stories to tell and insights to share from, say, month two. And we start getting a story out there and seating the market around the idea. Maybe that’s more qualitative-based, or more opinion, but you’re also trailing the release of bigger assets. With that search for agility, the research toolkit is being challenged and expanded, so we ourselves are increasingly using things like social media listening and sentiment-type tools. It’s taken a while for our cottage industry, if you like, to know how to use those to create robust research output that’s convincing enough for the C-Suite. But I think that we’re getting to that realm now. It’s much faster, and it’s much more cost-effective than some of these highly-engineered approaches. I don’t think we’re going to see the survey disappearing, but I think it’s being complemented by some far more agile options. So that’s one of the big trends, agile. Another trend is that we’re going to see a coming together, if you like, of data plus creativity. At the moment, the content campaigns that you see out there, the big ones, are major on the traditional thought leadership recipe – lots of research and lots of data – but the way that’s packaged and brought to the market may be a little dry and academic. At the other end of the spectrum, you see media-led campaigns, which are extremely good looking, and very visually creative, at least. But you dig a little and it’s fluffy messaging. I think nirvana is somewhere in between these things. We certainly advise our clients to get closer to a recipe that combine fodder for the left brain and fodder for the right brain, hitting both sides in terms of creative and data-led insight, bringing those worlds together. 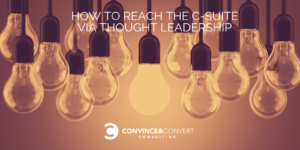 Chuck Kent is the Chief Conversation Officer at Lead the Conversation, a consultancy that helps busy executives more easily create authentic thought leadership content, including videos, articles and podcasts. He is also the sometimes songwriter for the man in plaid.